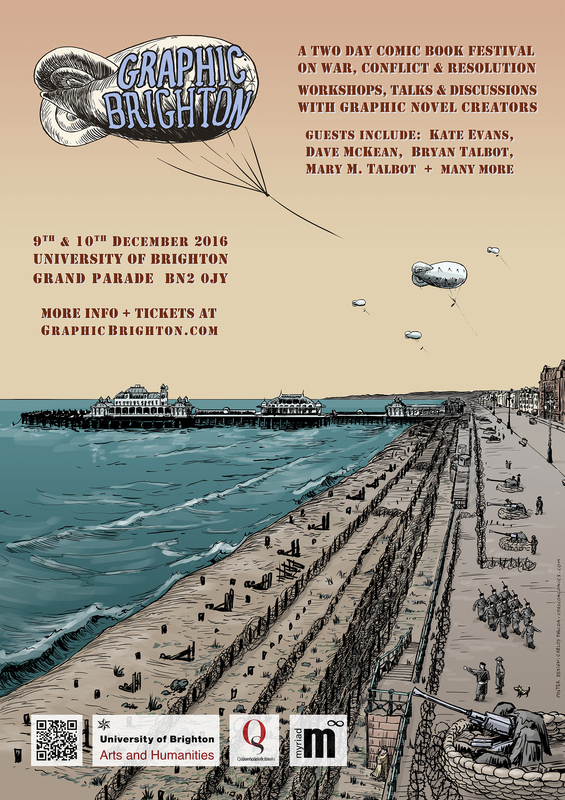 The poster for Graphic Brighton 2016 is now available, advertising graphic novelists such as Kate Evans, Dave McKean, Bryan Talbot, Mary M Talbot who will be appearing at the University of Brighton on 9th and 10th December 2016 to talk about their work. They will be joined by creators from Brighton’s Graphic War (published by QueenSpark Books), cartoonists Ben Dickson and Jaime Huxtable, Justin Wadlow from the French festival “Les Rendez-vous de la Bande Dessinée d’Amiens” and many more guests to be announced shortly. Tickets priced between £5 and £20 for all the public events, and £30 to £60 to include the additional academic strand, are available now from the University of Brighton online shop.